Genovese Basil – the favorite basil of Italy! Our most productive Kit will make all the pesto your heart desires. In only 4 months, this Kit grows up to $150 worth of basil vs. store-bought basil. 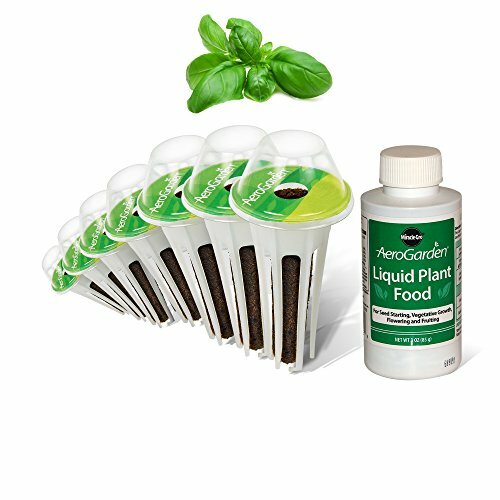 Our Pesto Basil Seed Kit comes with everything you need to grow and works in any of our AeroGardens! Great for pesto, pasta, sauces, and adding a tasty flair to special or everyday meals– now you can grow fresh basil all year round, no matter the season. Planting with Seed Pods is fun and easy! Just insert the pre-seeded Grow Pods in your garden, add water and the patented, specially formulated Liquid Nutrients. Most plants germinate within 7-14 days, are ready for harvesting in 4-6 weeks, and will keep producing continuous harvests for up to 6 months and longer. Indoor gardening can’t get any tastier or simpler!